My mother was visiting us and I was lucky enough to have her with me for her birthday after 7 years. Another reason this birthday was very special because this was the first time I was going to bake her a birthday cake. So this cake had to be something very special. She loves chocolate and I wanted to bake a decadent chocolate layer cake to celebrate this special occasion. 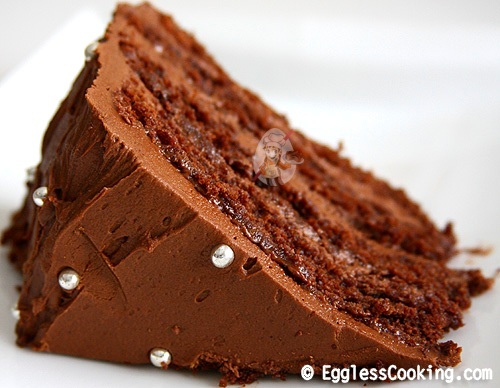 I already have an eggless chocolate layer cake in the blog. You may know it as the “I can’t believe it’s chocolate cake” recipe. It’s one of the most tried recipes in the blog with top reviews too. But that chocolate cake has only 2 layers. I wanted to make something big, a multiple chocolate layered cake. 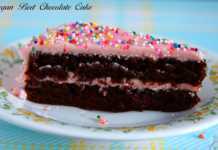 That’s when I found a moist chocolate layered cake recipe in a magazine. This cake has 4 layers. Even though it looks like you have to spend a lot of time making it, this is a simple chocolate layer cake recipe. It looked pretty easy and used only 2 eggs, so substitution was not a big issue. I used homemade applesauce recipe in place of the eggs. 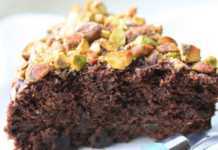 Unlike the other cake recipe which uses oil for the fat, this chocolate layered cake calls for butter making it a very moist, rich and delicious cake. Just one caution though, this one is super duper tasty, so don’t blame me if you indulge and gain some pounds. To make a vegan chocolate layer cake, substitute the butter with vegan butter like Earth Balance and for the buttermilk use non-dairy milk and vinegar. Preheat oven to 325F/160C for 15 minutes. Line two 9 inch round cake pans with parchment paper and grease it lightly with non stick cooking spray. Sift together the flour, cocoa powder, baking powder, baking soda and salt in a medium sized bowl. Stir until mixed. Beat butter with sugars in a large bowl, using an electric mixer on medium for about 3 minutes. Add the applesauce in two additions, beating well and scraping down sides of bowl after each addition. Mix in the vinegar too. The mixture will look curdled but don’t worry. Reduce speed and beat one third of flour mixture into butter mixture, then add half the buttermilk. Repeat additions, scraping down sides until well mixed. Divide batter evenly between pans and smooth tops. Tap the pans lightly to burst air pockets if any. Bake in center of oven until a tooth pick inserted in center of cakes comes out clean, 25 to 30 min. If using two racks, move the pan from the top rack to the bottom and the vice-versa in about 15 minutes. Cool in pans on a rack for 10 minutes. Run a knife around inside edge of each pan and then turn cakes out onto rack. Remove parchment. Let cool completely, about 1 hour. I actually left it overnight before I could frost the cake. Beat butter for icing in a large bowl, using an electric mixer/hand beater on medium, until creamy, 1 min. Add melted chocolate, vanilla, salt and 1 cup icing sugar. Beat for 1 minute. With mixer on medium-low, add remaining sugar in 3 parts, alternating remaining liquids (milk and coffee) and ending with sugar. Beat on medium-high, scraping down sides of bowl as needed, until fluffy and smooth, 1 to 2 minutes. 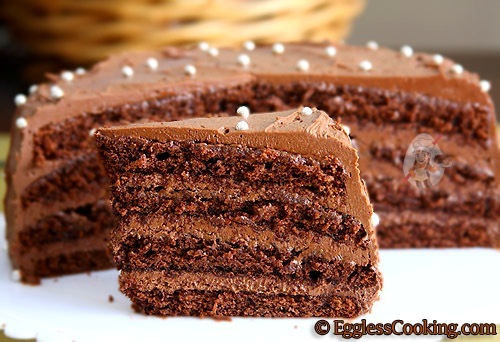 Be extremely careful while slicing each cake into half because its very delicate. One of my layers actually split in half and I somehow managed to patch it up and used it as the bottom most layer and covered it with the frosting. I think shrink wrapping the 2 cakes with plastic wrap once it has cooled completely and storing it in the refrigerator for a couple of hours will harden it up a little bit and slicing it into half won’t be much of a trouble. 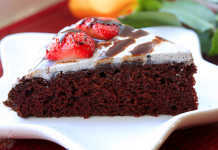 Check this chocolate cake recipe to learn about frosting a layered cake. The original frosting was a mocha frosting, which uses 1/4 cup of strong coffee to prepare the icing as I have indicated above. Since I didn’t want to add coffee I used plain water from the tap. You can use 1/4 cup of any liquid of your choice; water, coffee or milk. I tried making this recipe, the cake turned out to be good but I want to ask one thing, when I made the batter it was not flowing consistency (it was thicker) which is usually required for cake batters so I ended up mixing some hot water before putting it in oven. Can you please tell what should be the consistency and is adding water okay? It’s been a while since I baked this cake, so don’t remember exactly what the consistency was. Sorry about that, Shally. If you felt that it was too thick, add water shouldn’t be a problem. You don’t have to add hot water though, but I can guess why you chose to do that. But seeing the recipe now, I’m surprised that the batter was thick. I’m wondering if the butter was not soft enough, so it didn’t cream well to create enough moisture if you have used the other liquids like buttermilk and applesauce as mentioned in the recipe.